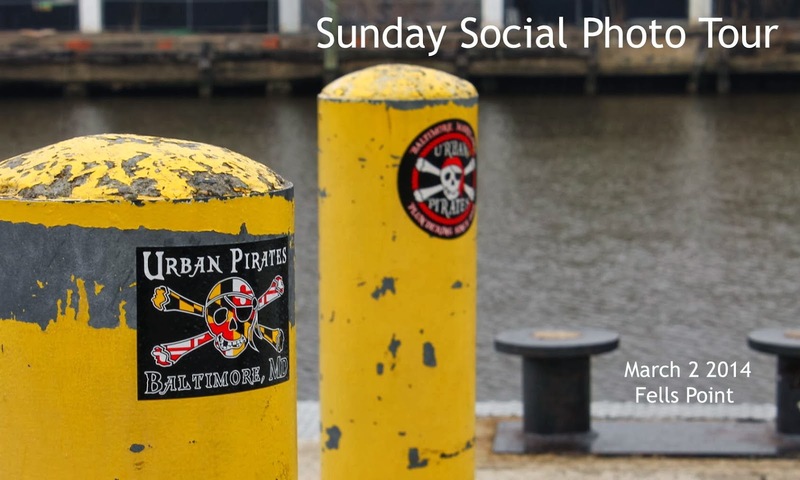 Baltimore Photo Social: Inaugural Sunday Social Photo Tour!! Inaugural Sunday Social Photo Tour!! This past Sunday, March 2, marked our first Sunday Social Photo Tour and Bar Hop. Held in Fells Point, 7 attendees came out to learn a bit about photography and have some fun! First, a bit about the tours: In December I was asked by Living Social if I had ever thought of doing photo tours. Apparently they are big in other cities and they were lacking a provider in Bmore. As someone who is open to any idea, I was happy to come up with a concept. Since we are a "Social" photography company (hoping to take the stuffiness out of photography) I wanted to create a relaxed atmosphere where instruction was simplified for beginners. I was able to accomplish that by bringing Deep Eddy Vodka aboard as a sponsor and focusing on one or two things each person wanted to improve on, instead of photography start to finish. We met at The Point in Fells for a brief mingling session, some yummy food, and a short explanation of (not quite) everything to do with digital photography. The idea was to give attendees enough info to know where to start learning. I initially thought we'd focus on shooting in Aperture Priority Mode, but as the day wore on, and each person wanted to capture something different, I suggested some switch to Shutter Priority and others to full Manual. Although it was both cold and rainy, we walked along Thames Street in Fells, and took shots from the pier near Bonaparte Bread, the courtyard with Schooner Lion and the old wharf building where they shot Homicide. We focused on shooting crisp landscapes (F8 or above) frame filling objects with bokeh (F4 or below) and straight lines with interesting compositions. I also had attendees shoot on different white balance settings to see what difference it made to their images. Halfway through, we stopped at Riptide Fells Point to enjoy some potstickers, bombs and review photos. Each participant was able to see their strengths and where they could improve for the second half of the tour. Back out on the street, we stopped near The Admiral's Cup where 2 students tried their hand at shooting on shutter priority while panning a subject, to imply motion. Although it takes practice, they both got the concept and are off to a strong start! After being out in the cold for a bit, Kilwin's Chocolates and Ice Cream on Thames Street were kind enough to allow us to shoot inside of their shoppe and warm up. A few students tried an interesting new technique: zooming their lens in or out while shooting on shutter priority, with a long exposure. They got some interesting effects that replicate warp drive! Then we walked down to How Great Thou Art and The Sound Garden for some more shutter priority shooting. The art store has a mirror ball outside which made for an excellent subject to imply motion. As the sun set (the best time for outdoor photography, second only to dawn) we were able to shoot beautiful scenes near Bond Street Wharf. Nearby Bond Street Social had some really cool fire fountains for subjects and we were right across from Under Armor, just in time for their sign to be lit! We finished up near Living Classroom across from The Domino Sugar Sign. In my opinion, it's one of the best places to shoot nighttime scenery in Baltimore. Although not everyone had a tripod, which is essential for night photography, students were able to make due with the posts along the pier as stand in tripods. See below for some of mine and student submitted photos from the tour. And for more info, visit our website or follow us on FB and Twitter!